On the evening of Sunday, January 27, 2013, I had dinner with my dad at his house. He cooked pork chops. My mom and sister Lara is with my sister Mia and her family in San Mateo, California. On the afternoon of Saturday, January 26, 2013, Deputy Prosecuting Attorney Tricia Nakamatsu and I worked on testimonies for bills scheduled for hearings in the Hawaii State Legislature next week. In the evening, we attended a gathering under a mango tree and “talked story” with friends I am lucky and honored to have made over the years: former House Sergeant of Arms Frank Arakaki, former Senator Joe Tanaka, former Honolulu Councilman Jon Yoshimura, former Senator Whitney Anderson, former Senator Donna Ikeda, Honolulu Councilman Ikaika Anderson, Maui Deputy Prosecuting Attorney Richard Minatoya, Alika Thompson, James Pacopac, Eddie Hayashi, Dr. Jeffrey Akaka, Alec Sou, and others. 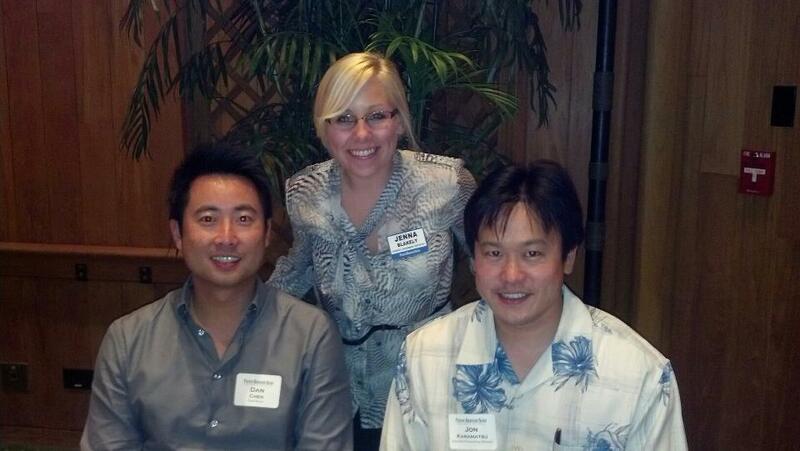 Dan Chen, Jenna Blakely, and I at Pacific Business News “Book of Lists” event at Halekulani Hotel on Thursday, January 24, 2013 at 7:25 p.m.
On January 25, 2013, Deputy Prosecuting Attorney Tricia Nakamatsu and I had a meeting with Senator Will Espero (Chair of Senate Public Safety Committee) at his office at 9:30 A.M., Speaker Calvin K.Y. Say at 10:45 A.M. at his office, and Representative Roy Takumi (Chair of House Education Committee) at his office. At 2:00 P.M., Deputy Prosecuting Attorney Tricia Nakamatsu and I attended the House Judiciary Committee hearing at the Hawaii State Capitol. I testified in support on our two Honolulu Prosecuting Bills: HB231 RELATING TO USE OF FORCE BY PERSONS WITH SPECIAL RESPONSIBILITY FOR CARE, DISCIPLINE, OR SAFETY OF OTHERS and HB232 RELATING TO SENTENCE OF IMPRISONMENT FOR SEXUAL ASSAULT OF A MINOR UNDER THE AGE OF TWELVE YEARS. I also commented on HB238 RELATING TO PROMOTING INTOXICATING LIQUOR and HB 28 RELATING TO JURY SELECTION. HB231 and HB232 will be voted on Thursday, January 31, 2013 at 2:00 P.M. HB 238 and HB28 were deferred indefinitely. After reviewing bills for upcoming hearings, I went to “Art After Dark” at the Honolulu Musuem of Art with Senator Will Espero at 7:30 P.M. My friend Jon Nishihara and his friend Winston joined us as well. On January 23, 2013, Deputy Prosecuting Attorney Tricia Nakamatsu and I had a meeting with Hawaii House Judiciary Chair Karl Rhoads at 9:00 A.M. at his office regarding the Honolulu Prosecuting Attorney Legislative Package. At 6:00 P.M., I attended the University of Hawaii Businiess Alumni Association and Hawaii State Bar Association’s Young Lawyer Division’ social at the Vice Club in Honolulu, Hawaii. On Sunday, January 20, 2013 I had dinner with my dad at Ichiriki in Aiea, Hawaii at 5:00 P.M. We ate the Ichiriki nabe and miso chanko nabe. My mom and sister Lara is with my sister Mia and her family in San Mateo, California. On Saturday, January 19, 2013, I attended the fundraiser for Christopher Otto at the M Nightclub in Restaurant Row from 6:30 P.M. The event raised funds to help Chris with his medical expenses as he fights cancer. I found out about this event through a friend of his. I wish him a successful comeback.